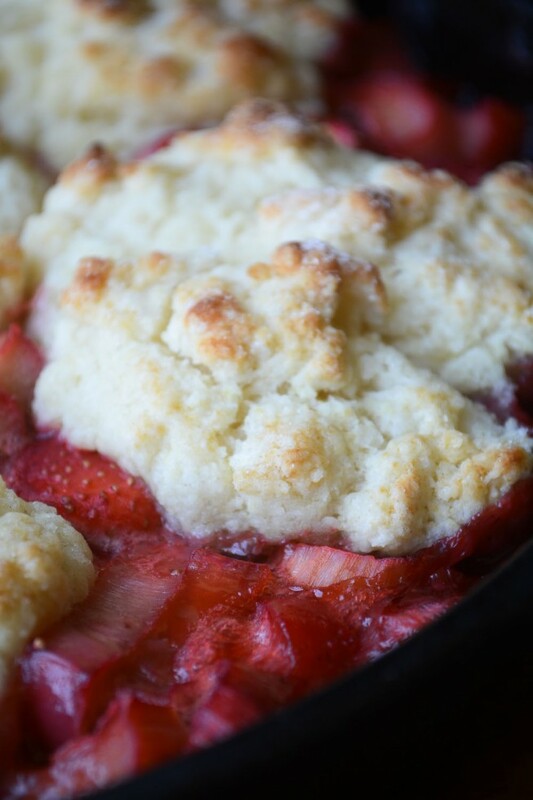 Strawberry Rhubarb Cobbler ~ it’s one of the joys of the season, with juicy ruby red strawberries and rhubarb bubbling up around a flaky biscuit dough, what are you waiting for? Don’t you love that first whiff of change in the air when a new season arrives? 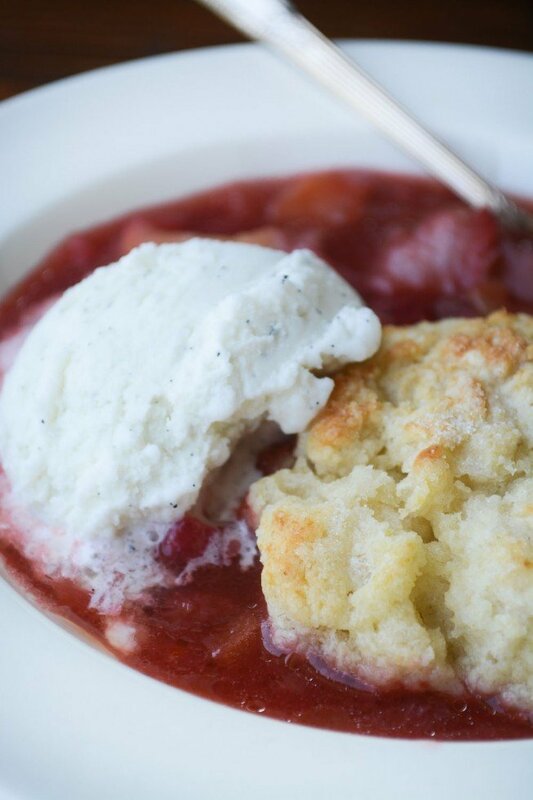 For me it’s just as thrilling when I make the first favorite recipe of the season — Strawberry Rhubarb Cobbler is the very essence of spring. 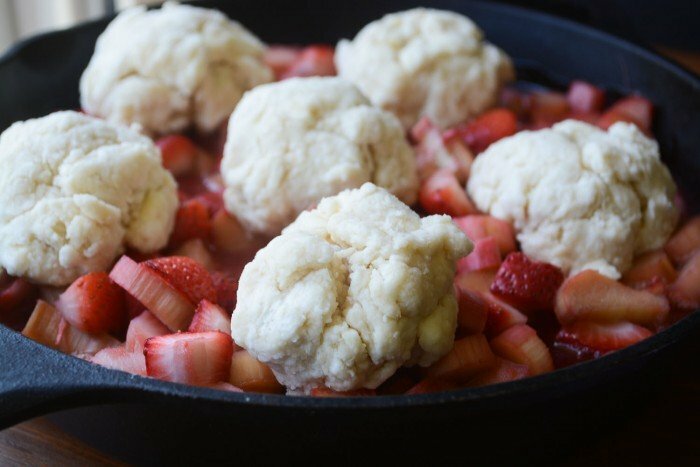 The minute I saw the crimson juices bubbling away in the skillet it all came flooding back to me, strawberry and rhubarb are phenomenal together. Not only do they create this glorious hybrid rosy pinky peach color, but the sweet of the strawberry tames the tang of the rhubarb and the two are better together than apart, like the best of marriages. So now begins a new phase in the cycle of seasonal eating. 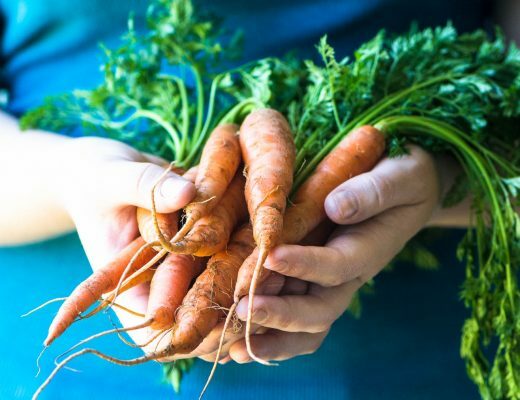 We’re passing out of the leanest period and approaching the most invigorating — edible flowers, baby veggies, little sprouts and shoots, new… tender… fresh… all those words we haven’t used in so long. This cobbler is no more difficult or involved to make than a classic crumble or crisp, the only difference is that the topping is more of a dough, held together in this case with a little yogurt. The bubbly filling is tart and juicy, and the biscuit is light and fluffy. It looks more voluptuous and impressive than a crisp, and it is! Make it with any spring or summer fruit you want. I’ve been watching for rhubarb like a hawk and finally found it the other day. This recipe is as old as it is delicious. Cobblers and their counterparts, Bettys, grumps, slumps, dumps, buckles, pandowdys, and sonkers are all traditional American recipes, some dating way back to the first settlers. They’re some of our most beloved desserts, and it’s clear why. The fruit cooks up into a rich syrupy base and the biscuit is fluffy and warm, and the ice cream, don’t forget the ice cream, melts in little rivulets throughout it all. The biscuit topping on this cobbler is very easy to make, and it can be used to top all kinds of fruit. Don’t try to get it perfectly round or even, the dough is supposed to look a little ragged, and the reward for not working it too much is a tender, flaky texture. Strawberries and rhubarb make a great team, but they’re sensational on their own, too. It’s all about the berries in my STRAWBERRY JALAPENO SALSA, and rhubarb goes it alone in my NO BAKE RHUBARB DREAM BARS and my RHUBARB CRUMB BARS. 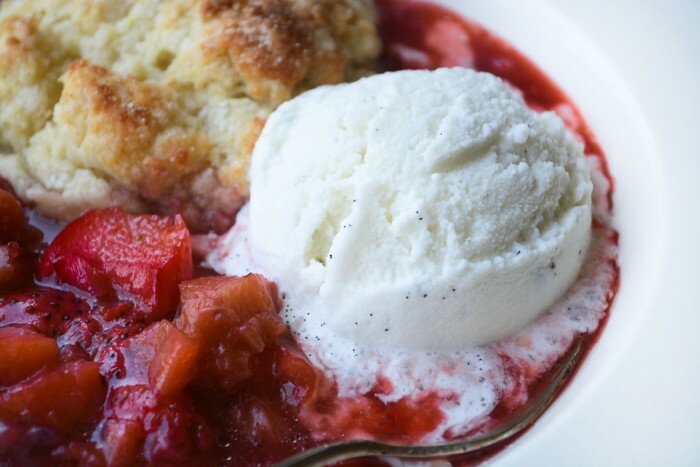 Strawberry Rhubarb Cobbler ~ it's one of the joys of the season, with juicy ruby red strawberries and rhubarb bubbling up around a flaky biscuit dough, what are you waiting for? Toss the fruit with the sugar and lemon juice and let sit for about half an hour. This will get the juices flowing. Stir in the flour and spread the fruit out into a 9" cast iron skillet or a square baking dish. Bake the fruit for 10-12 minutes. You should see a little bubbling beginning to happen. Meanwhile make the biscuit topping. Put the flour, sugar, baking powder, soda, and salt in the bowl of a food processor. Pulse to combine. Pulse in the cold butter until the mixture is crumbly. Turn out into a bowl and stir in the yogurt, adding a little cream or milk if the mixture seems too dry. Mix just until the dough comes together loosely. Form into 6 equal mounds. Don't worry about getting the dough into smooth balls, it will be 'craggy' and lumpy. that's going to be the charm of your cobbler topping, and it means the biscuits will be light and fluffy. Sprinkle each mound of dough lightly with sugar. Place the six biscuits on top of the hot fruit, setting then apart so they don't touch. Bake for another 16-18 minutes until the dough is golden and cooked through. Cover with foil at the end if it is getting too brown. 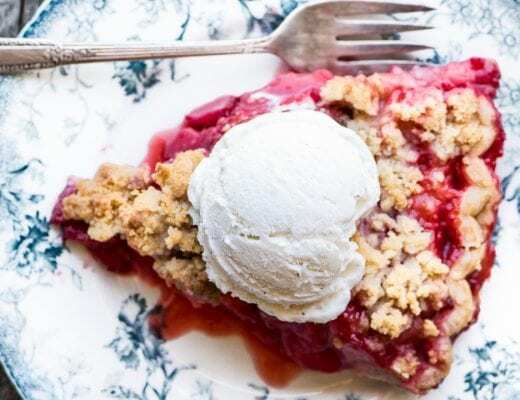 You could swap all sorts of fruits for the strawberry and rhubarb in this cobbler–it would work beautifully with any kind of berry, stone-fruit in the summer, or apples and pears in the fall! Make this recipe gluten-free by substituting a gluten-free biscuit recipe–like this one from King Arthur Flour! 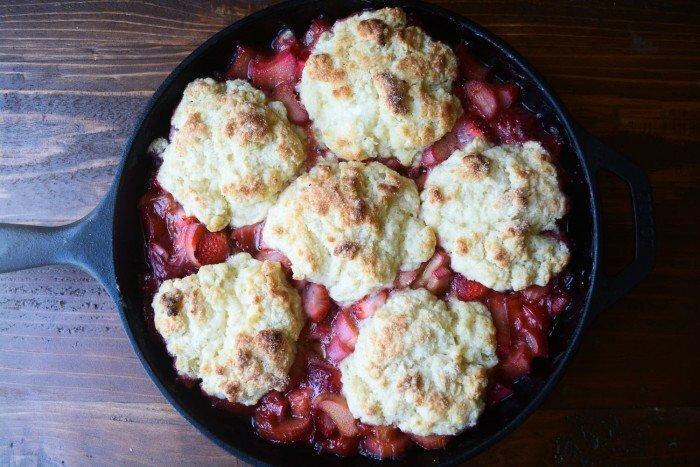 Thanks for pinning this Strawberry Rhubarb Cobbler! I made these twice in my cast iron pan on the grill. It cooked while we were eating our grilled dinner. It was amazing!! Add a small box of strawberry jello. Just sprinkle it over the fruit. It adds more intense strawberry flavor. I just made a real nice vinaigrette which I may post, it’s such versatile stuff. Ahhhh there is nothing that screams spring to me more than Rhubarb. I can’t wait for my first batch to be ready. And I’m totally trying it in this delicious cobbler! as vehicles for vanilla bean ice cream go, this one’s pretty outstanding. Somehow – inexplicably – MN is having a spring. The rhubarb is up and your recipe is perfect timing (now, if only our strawberries were in). I am inspired to start spring cooking and baking! What a delicious post. Such a pretty cobbler, I’d happily skip dinner in favor of an ample serving of cobbler :). Fruit cobblers are one of my favorite parts about warmer weather! This looks wonderful – I need to get my hands on some rhubarb! Oh thanks so great Chris — thanks for the feedback! I’ve been obsessed with all things rhubarb lately, and I may have to make this soon! 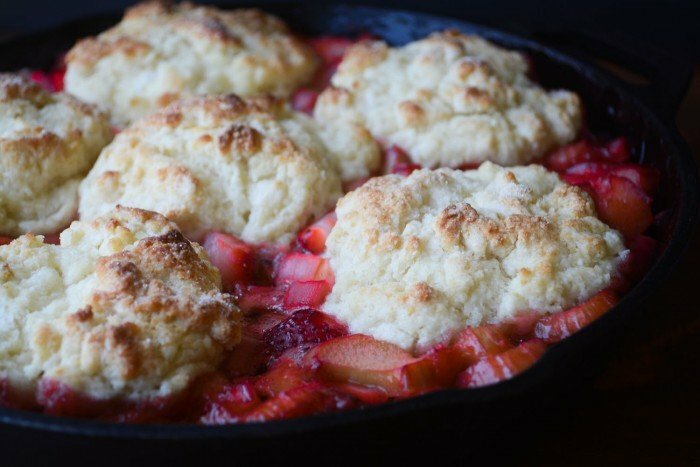 I’ve done peach cobblers before, but never anything with strawberries or rhubarb. Love it! Thinking of rhubarb reminds me of grade school. Walking home from school I always passed a house with a huge rhubarb patch out front. I was always tempted to break off a few stalks. Your cobbler looks more than delicious and you can tell that those biscuits are light and tender. I am so ready to start eating ALL THE RHUBARB!! This is glorious. Always love the colours of any dishes with rhubarb in it. 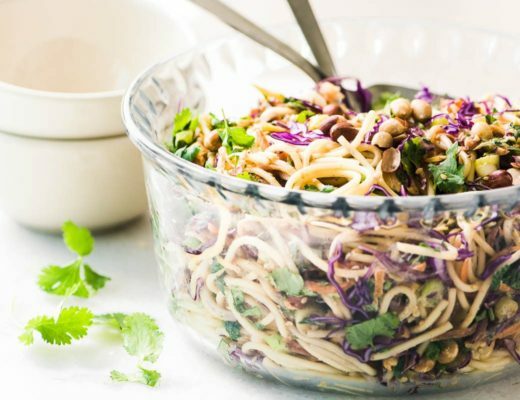 This dish looks so delicious. Thanks for sharing! I have never made anything with rhubarb but I know a lot of people that do. This looks like something my family would love. Perfect tender biscuits over such a marvelous fruit filling! What a wonderful spring dessert! Sue, I don’t use rhubarb nearly enough! Thanks for this lovely reminder to pick some up very soon. Usually, I make a pie, but the cobbler sounds so good right now. I love rhubarb, and when combined with strawberries there is nothing better. The biscuit topping looks perfect. I could definitely eat those without the help of any fruit. :) Thank you for sharing! Thanks Renee, I’m so happy you stopped by! My rhubarb plants have surfaced and I have lovely red-stemmed frilly leaves getting bigger each day. I can’t to try this when I can cut my first harvest! It looks luscious! omg could there be anything cuter than baby rhubarb?? Very nice Sue! Nothing beats a spring cobbler. Love it in the skillet too :) Awesomeness in a pan! I have never had rhubarb until I went and bought some last week! My mother used to pick it at night from our neighbor’s garden and then stew it. She told us we wouldn’t like it. I think she was keeping it all for herself! I am now a rhubarb lover and this recipe looks like something to love! Is there a chemical reaction between the fruit and cast iron? Not that I know of, Carol, it worked fine!